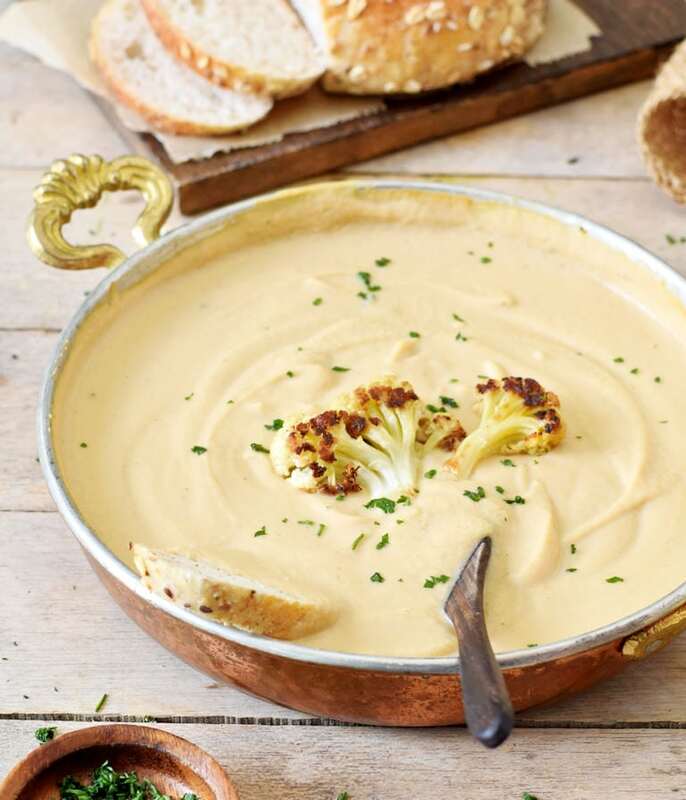 The creamiest roasted cauliflower soup which is furthermore vegan?! Yes, please! This flavorful soup is made with wholesome ingredients, all plant-based and gluten-free. The recipe is easy to make and perfect as weeknight dinner! It seems that soup is my latest obsession! But this isn’t really surprising because soup is simply amazing! It’s hearty and comforting and I often call it soul food. Lately, I have been sick with the flu (boo!) and the only thing I really enjoyed eating was soup. 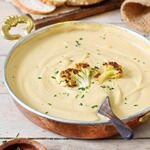 My favorite soup was this creamy roasted cauliflower soup and today I want to share this vegan recipe with you! Roasting the cauliflower brings out so much flavor! And the process is super easy! All you need is one head of cauliflower, a little bit of oil, a pinch of salt and an oven! Sounds easy right? It is! Beside cauliflower, you will also need a couple of other vegan ingredients which make the soup creamy and flavorful. For extra creaminess, I added soaked cashews. 1/3 of a cup (50 grams) is enough to make the soup extra creamy! If you are allergic to cashews (or nuts in general), don’t worry! You can simply use 50 grams of shelled hemp seeds as a substitute and you don’t even have to soak them. However, it’s also possible to leave out the cashews completely. The soup will be less creamy but still very delicious! I also added white cannellini beans, because they are a great source of vegan protein, they taste delicious and also make the cauliflower soup creamy. You probably already have all the other ingredients, such as vegetable broth, plant-based milk, and different spices, at home. As mentioned before, this roasted cauliflower soup is seriously so easy to make and doesn’t require many ingredients. 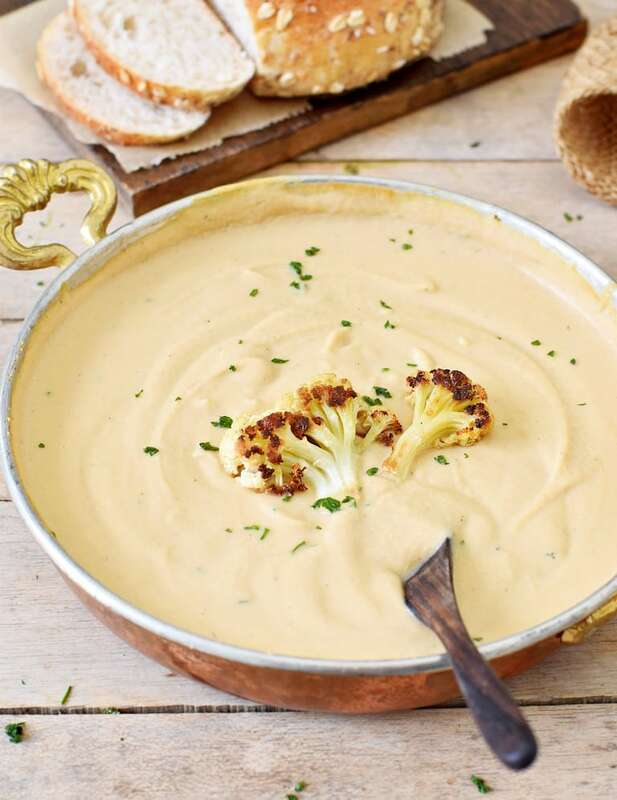 How To Make A Roasted Cauliflower Soup? It’s very easy to make this healthy cauliflower soup. You begin with soaking the cashews (you can boil them for 15-20 minutes until they are soft). Then you roast the cauliflower in the oven. Meanwhile, you can rinse the cannellini beans and measure the other ingredients. 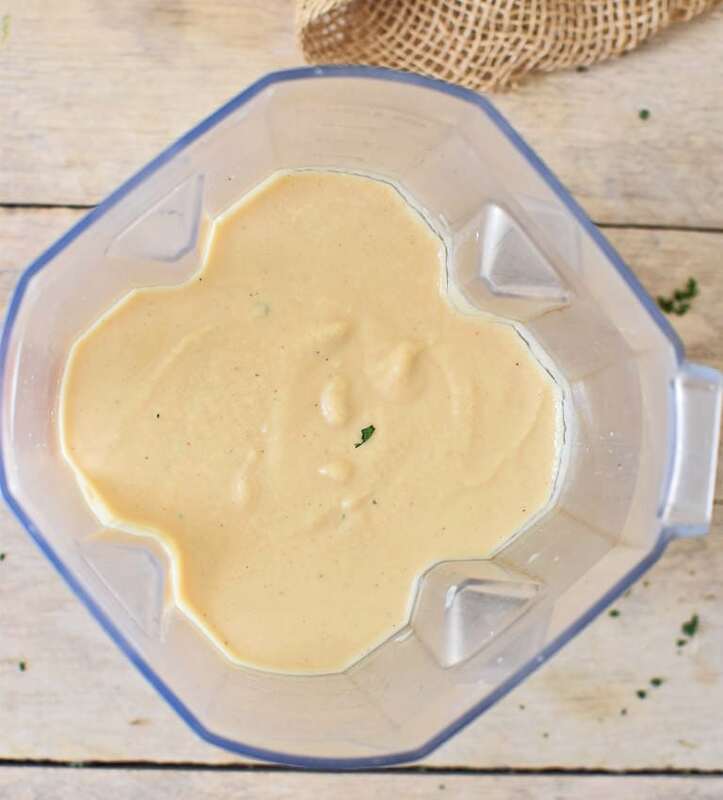 Once the cauliflower is ready, you add all ingredients into a blender and blend until smooth. Finally, you transfer the soup to a pot and warm to the desired temperature. And that’s it! Can I Freeze The Soup? 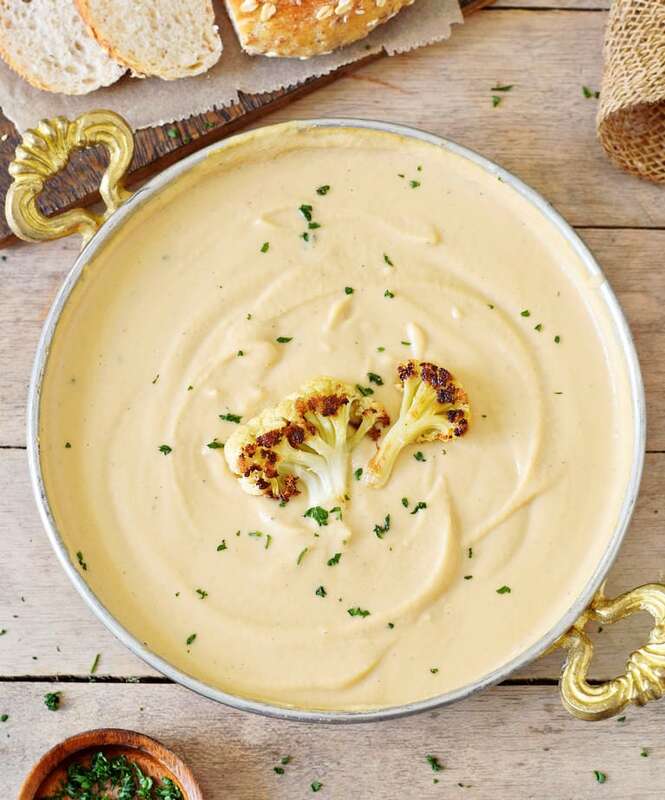 This creamy vegan cauliflower soup tastes best when it’s warm. Leftover soup keeps well in the refrigerator for up to 3-4 days (make sure to cover it). It’s also possible to freeze the soup for a couple of months. 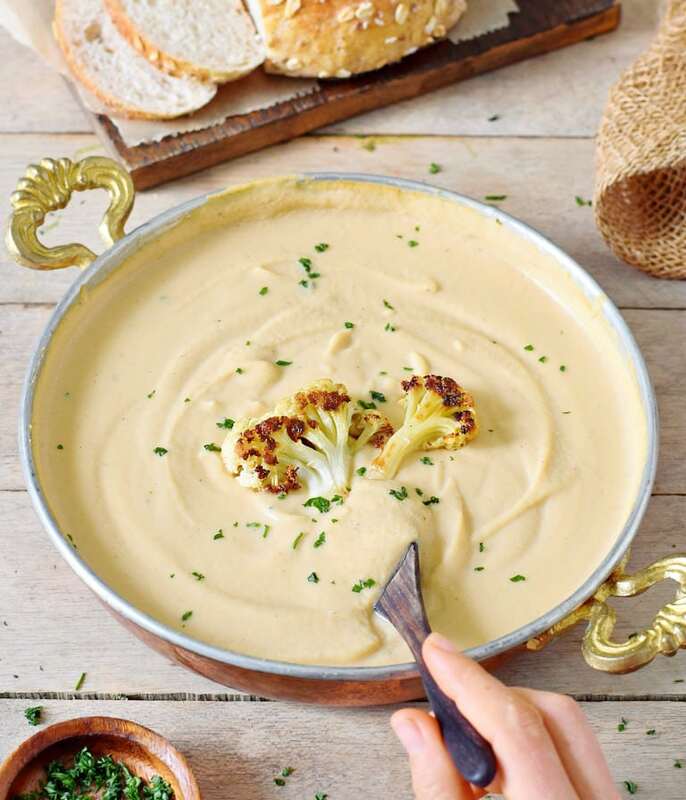 Should you recreate this creamy roasted cauliflower soup, please leave a comment below and don’t forget to tag me in your Instagram or Facebook post with @elavegan and #elavegan because I love to see how your soup turned out! And for more soup recipes, definitely also check out this Creamy Pasta Soup and this Best Lentil Soup Recipe! 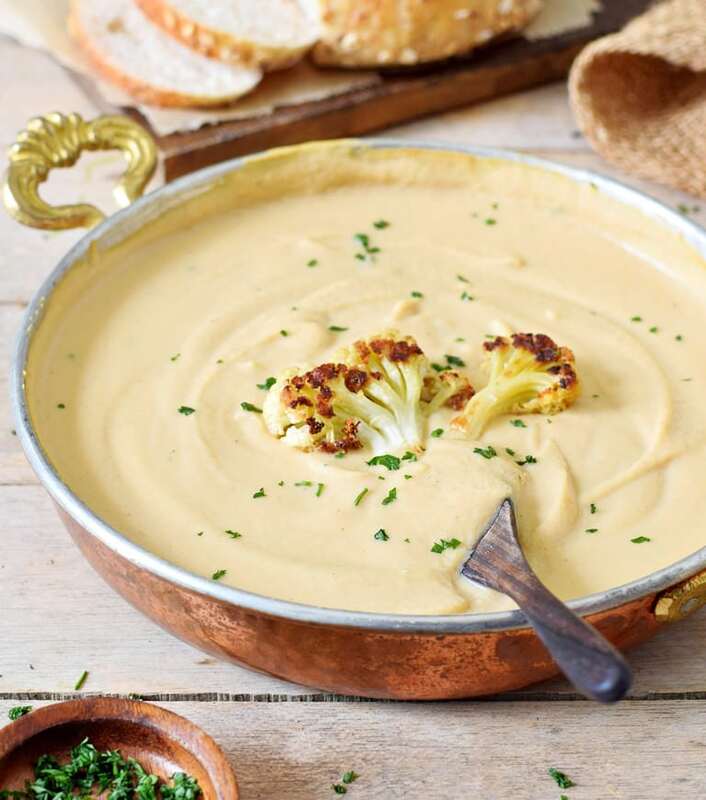 The creamiest vegan roasted cauliflower soup! This flavorful soup is made with wholesome ingredients, all plant-based and gluten-free. The recipe is easy to make and perfect as weeknight dinner! Soak cashews for a couple of hours or boil them for 15 minutes in water until they are soft. Cut the cauliflower into florets, spread on a baking tray (lined with parchment paper) and drizzle with 1 tablespoon oil and a little salt. 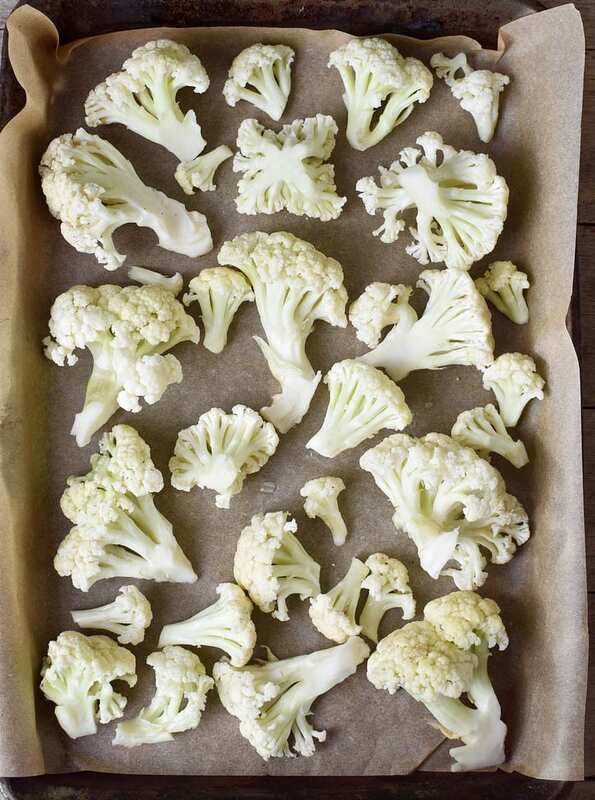 Toss with your hands and roast the cauliflower in the oven for about 30-35 minutes until nicely browned and tender. Set aside a few cauliflower florets for garnish. In a blender, combine all ingredients (add the broth & milk in batches if necessary) and blend until completely smooth. Taste the soup and adjust seasonings. If you prefer a spicy soup, add some hot pepper flakes! If the cauliflower soup is too thick (it does get thicker as it sits), add a little bit more broth or plant-based milk and blend again. Transfer to a pot and warm to the desired temperature. Garnish with fresh parsley and the reserved cauliflower florets. Enjoy! You can use shelled hemp seeds instead of cashews or leave them out (the soup will be less creamy though). I made this for dinner a couple of nights ago. I roasted my garlic with my cauliflower and used butter beans instead of cannellini beans as that was all I had in the cupboard. It was delicious and I will definitely be making again. Best soup ever! Very creamy and filling and extremely easy to make. I added seitan bacon and whote sweet potatoes. I made this tonight and absolutely amazing! Wished I had the break down of calories, fat and carbs. I used garbonzo beans because the other ones were still cooking! 5 stars! You make the easiest, yummiest recipes! Thank you for your content, I’m a huge fan!